Hi, trying to track down a Gilet that was left at Cambus last Saturday after the JIRCs, Denise Wright passed it over at Forvie, said Iain Macleod should be able to help, any chance he could hand it over to Denise tonight at Sprint, I don’t have his email. 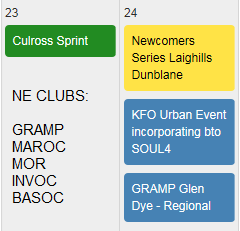 Iain doesn’t usually come to the Urban Sprints these days (which means he’ll prove me wrong now and turn up!) but I’ll send you his email when I get home tonight and you can arrange something else.